There are two general types of food packaging plastic materials, fossil-based plastics and bio-based and biodegradable plastics. Fossil-based plastics are derived from petroleum. Bio-based and biodegradable plastics are derived from natural materials that readily break down in the environment. a composition deriving from mainly natural substances that break down over time, with the environment, the materials’ composition, and the time-frame all factoring in how quickly the break-down occurs. including the food-packaging and the food service industries, have been working to reduce the use of fossil-based packaging materials. These fossil-based plastics have become the most tenacious polluters of the environment worldwide. The main environmental impacts are these: 1) they leave a high carbon footprint, thereby contributing to global warming; 2) they damage the air, becoming toxic when combusted; and 3) they have detrimental effects on wildlife, waterways, and other natural spaces. In addition, they can take decades to thousands of years to decompose. than conventional plastics. Because these materials are much less harmful to the environment than fossil-based plastics, their use has been on the rise. fossil-based plastics. Their usefulness to the food packaging and the food services industries is dictated by their material composition, which consists of blended substances and are called called polymers. Types of bio-based and biodegradable polymers are polylactic acid (PLA), biodegradable starch-based plastics, cellophane, biodegradable and bio-based polyesters, drop-in bio-based materials, polyethyline furanoate (PEF) and others. New bio-based and biodegradable polymers are under development. biodegradability varies depending on the ratio of their blends (polymers) of bio-based and fossil-based derivatives, the environment surrounding them, and their own condition. or decomposing them when certain environmental conditions are met and working in conjunction with the polymers’ chemical composition and the polymers’ condition. 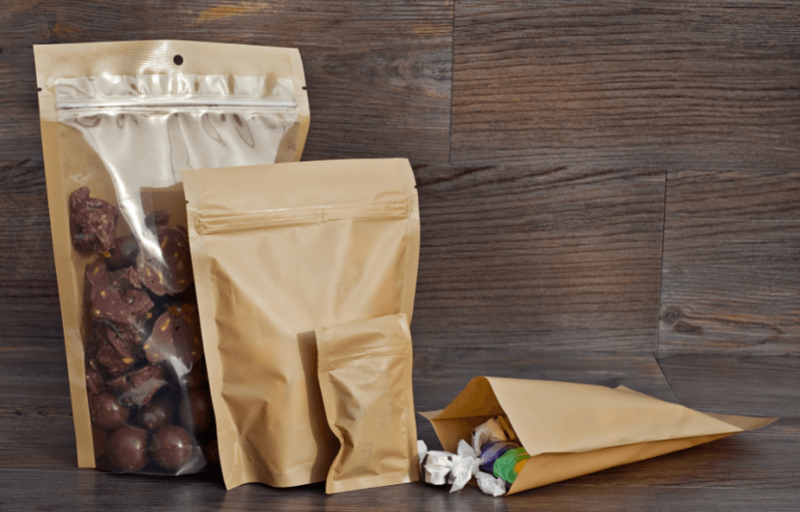 Some concerns arise in the food industry with regard to bio-based and bio-degradable packaging plastics. These concerns have to do with the bio-based plastics’ uses, packaging attributes, shelf-life, food protection and safety levels. We offer a selection of biodegradable plastic material options for use with creating biodegradable packaging, and compostable packaging. 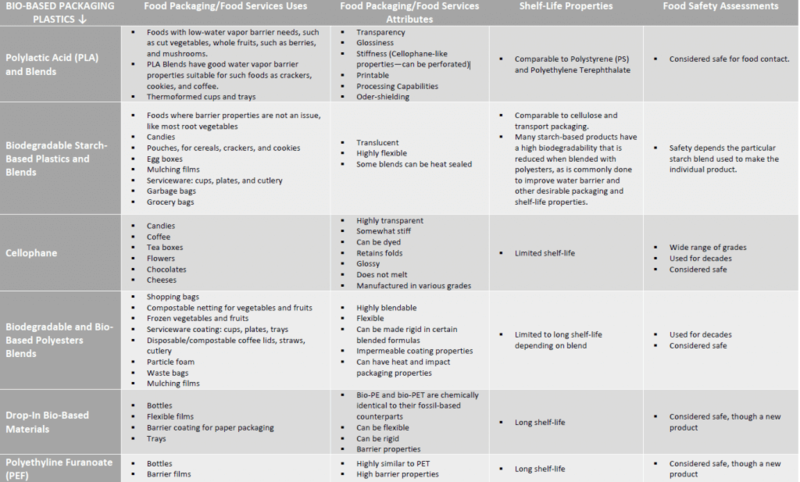 Below is a table of the most commonly used bio-based plastics, their uses, their packaging attributes, their shelf-life, and their established safety levels. Greene, J. P. (2014). Sustainable Plastics: Environmental Assessments of Biobased, Biodegradable. John Wiley & Sons. Oever, Marien van de, Karin Molenveld, Maarten van der Zee, and Harrietter Bos (2017). Bio-based and biodegradable plastics—Facts and figures. No. 1722. Wagneingen Food & Biobased Research.